In stock -This product will ship today if ordered within the next 2 hours and 7 minutes. We are unable to deliver this product outside the UK mainland due to postal restrictions. Pacifica Roll On Perfume Indian Coconut Nectar - Pacifica Perfume Roll-ons are really a steal. As always, we look for ways to bring our customers value without skimping on quality. These contain our best-selling fragrances in natural grain alcohol. And, they are free of phthalates, nitro-musks, benzene, and other things you don`t want. Alcohol denat (natural grain, parfum (Pacifica`s own fragrance blend with natural and essential oils), aqua (water). Below are reviews of Pacifica Roll On Perfume Indian Coconut Nectar - 10ml by bodykind customers. If you have tried this product we'd love to hear what you think so please leave a review. 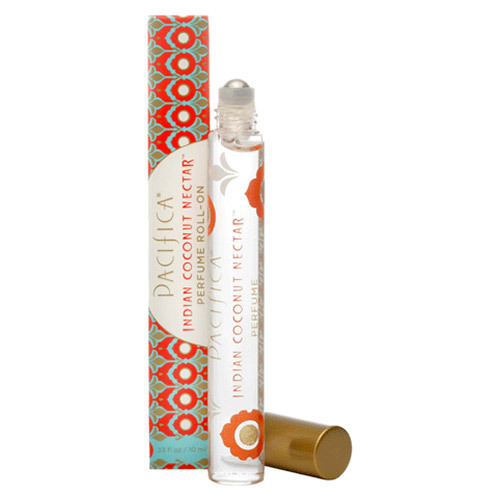 Pacifica Roll On Perfume Indian Coconut Nectar - Pacifica’s Indian Coconut Nectar is a sensuous and delicious blend inspired by travels to faraway destinations. This warm, sultry blend of coconut and delicate creamy vanilla is pure ambrosia.